Shelducks have considerably changed their behaviour in recent years. Ancestrally a coastal breeder, they now occupy more tetrads inland than at the coast, and from 1993 onwards they have abandoned their traditional post-breeding moult migration to the Heligoland Bight and up to 20,000 birds gather in July to moult on the Mersey estuary, the largest flock in Britain (Wells & Friswell 1998). Shelducks were confirmed or probably breeding in 59 tetrads in our First Atlas; this has risen to 98 tetrads in those categories now. The 66% increase is almost entirely in inland areas, more than 2 km from tidal waters, as the species has spread across lowland Cheshire. Following occasional previous records, inland breeding in the county has been annual since 1977. The habit rapidly took hold and there were 7 inland tetrads with confirmed and 12 with probable breeding in our First Atlas, and 12 tetrads confirmed and 47 probable in this survey. Shelducks also now nest on Hilbre: they just missed out on our First Atlas, nesting in 1985 but not during 1978-84. In the estuaries, birds feed on the flowing tidal water, but not much around high or low tides, mostly sieving the mud for the tiny snail Hydrobia which forms the overwhelming majority of their diet. They also eat shrimps, small clams Macoma and ragworms; it is not known on what the inland breeders are feeding. Breeding Shelducks establish and defend territories of around 1 ha in size, in which pairs do most of their feeding, but these territories do not contain the nest-site, nor do they bring their brood to the same area. Non-breeding birds stay in flocks until they are two or three years old. The female chooses a nest-site, most often in a rabbit burrow, but they will use a variety of suitable holes including in trees, crevices in haystacks, nest boxes (as suspected in the Wybunbury area (SJ65V)), and even in man-made structures. A female laid eight eggs in the hide at Hale Duck Decoy in 2003. Colin Schofield saw a pair fly out of a dockside building in Birkenhead (SJ39F) on 9 June 2004, and even in such incongruous surroundings it is likely that they had at least been prospecting for a nest-site, or may have already had a nest inside. Eggs are normally laid from mid-April onwards, into June, although young had hatched by 23 April 1995 at Budworth Mere. Typical clutches contain 8-10 eggs, sometimes up to 12, but there may be more where another female has dumped some eggs into the nest. The female alone incubates, for about 30 days, with the male avoiding the nest for this time, but he knows when the chicks are hatching and returns to guard them and his mate. Despite being accompanied by both parents, many chicks, perhaps two-thirds of the brood, die, usually in the first week or so of life, often from predation by large gulls, but it is seven weeks before they have grown enough to fly. Some pairs look after their offspring throughout this period, but many chicks gather into crèches, with a few adults watching over groups of twenty or more youngsters (Patterson 1982). Crèches of 66 and 41 young were counted in Stanlow Bay in 1999 and a massive crèche of 149 chicks was seen off Ince on 2 July 2000 (CWBRs). Nearly all of the records of confirmed breeding in this Atlas came when fieldworkers spotted a pair with their delightfully-plumaged chicks, 11 being the largest brood noted. There were five tetrads where a bird was seen visiting a probable nest-site (N), and a further five with pairs displaying, but the vast majority of probable breeding records refer to pairs seen. Such paired birds are not necessarily intending to breed but may be prospecting the area for future years. 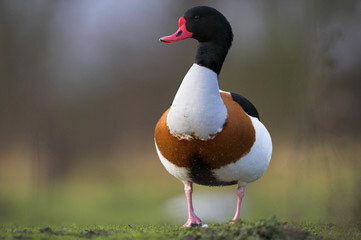 With their wide range of nesting areas, Shelducks were catholic in their choice of habitat. Almost all of the inland birds were on standing waterbodies, of all sizes, with birds often seen spreading out into adjacent grassland, either semi-natural or agricultural land, and sometimes into tilled crops. Some of the most favoured estuarine tetrads held tens of pairs, and surveys in 1998 of the Mersey estuary led to a population estimate of 100+ pairs (CWBR). Few inland tetrads held more than one or two pairs, however, and the county population is likely to be around 200 pairs, considerably more than the estimate twenty years ago of 25-50 pairs.